How Is Cape Aloe Used in Medicine? Ampalaya, more commonly known as bitter melon, is a fruit-bearing vine that grows in tropical and sub-tropical climates. As the name implies, the fruit is quite bitter in its unripened state, but as an acquired taste it has been cultivated in some parts of the world for generations and is routinely eaten as raw fruit or salad greens. Products of the plant, its heart-shaped leaves in particular, have also historically been used in natural medicine in the Philippines, China and other countries. 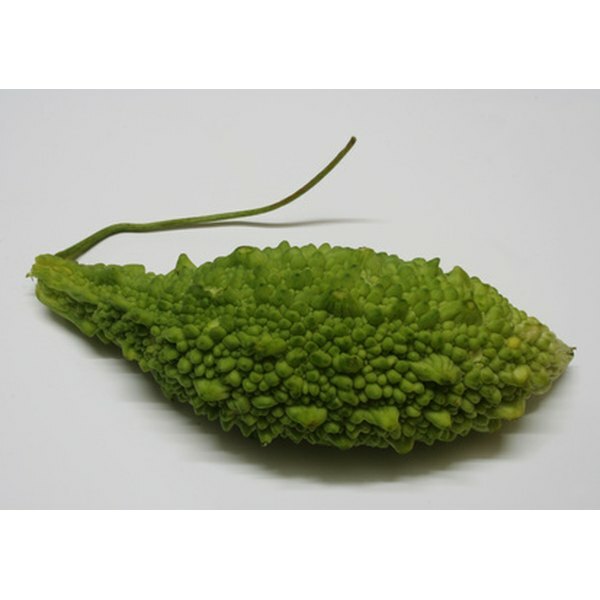 The most common medicinal use of ampalaya leaves is as a treatment for diabetes, particularly type 2 diabetes. The origins of this treatment can be traced back to folk medicine traditions in the Philippines, China and India, but modern science has since proven the bitter melon's hypoglycemic effect. A 2003 study published in volume 88, issue 1 of the Journal of Ethnopharmacology tested several powdered ampalaya extracts on diabetic rats, and found that ampalaya reduced fasting blood glucose by nearly 50%, a rate comparable to synthetic diabetes drugs. Another study published in the Philippine Journal of Internal Medicine found that ampalaya tea is a well-tolerated dietary adjunct for type 2 diabetes sufferers, with the only notable side effect being an increase in bowel frequency for some users. Though human research into the efficacy of ampalaya leaves for diabetes treatment is limited, it remains popular for this purpose, especially in the Philippines where the dried leaves are widely available in capsule and tablet form. Dried leaves may also be steeped in hot water and consumed as tea, and fresh leaves can be juiced and consumed at a rate of one tablespoon per day for improved glucose management. In the form of a powdered decoction, ampalaya leaves and roots are known to have astringent properties, meaning that they can shrink tissues. While the powdered leaf extracts may be effective for treating a wide range of conditions that call for topical astringents, including eczema, psoriasis and rashes, they are more commonly marketed specifically for the treatment of hemorrhoids. To treat external hemorrhoids with powdered ampalaya leaves and roots, lightly dampen the affected area with water and apply the powder directly to the hemorrhoids. Another documented use of ampalaya leaves is as topical wrap or compress for minor wounds, burns and a wide variety of other skin issues. Fresh leaves can be slightly warmed and applied directly to the affected skin for immediate relief, or a compress can be made from crushed or muddled ampalaya leaves and a little bit of warm water. Such external applications may relieve pain, reduce inflammation and accelerate the healing process. Applying these treatments directly to the forehead, temples and neck may also relieve headaches. Taken orally, ampalaya leaves are cited as natural solutions for conditions including chronic cough, diarrhea, fever, worms and parasites. Recommended preparations for these treatments vary, but include ingesting ampalaya leaves in tablet or capsule form, steeping dried leaves as tea or consuming freshly juiced leaves. The fruit and leaves may also be juiced and consumed together.